For all the lovers and haters of tablet devices, the one thing they can agree on is a speaker not facing you when your watching the screen can lessen your enjoyment. The larger screen size of the ‘classic’ iPads makes is fine for two people to enjoy a movie at the same time. Or, FaceTime with someone in a far away land, seeing them quite clearly. Though, hearing a person talk or the full sound of a movie is limited since the speaker is in the back. We have all said, “oh, it’s fine, I can still hear it”. The truth is, the sound quality is greatly negatively impacted as you wait for the sound to bounce of something behind the iPad and come back forward to your ears. Happily, Friday our Amplifiears showed up. When these were first starting to be talked about at the office, they were a Kickstarter project (available to the public now via the Amplifiear site). Everyone had the same idea, grab two and make their iPad into a Mouse looking device as one was placed on each upper corner of the device. When they showed and where installed, all the kidding around stopped. Many of us have gotten good at holding our hand cupped around the speaker edge of the iPad so the sound is funneled to us. Now, Amplifiears does that for us, boosting the sound output a full 10 dB! Four units arrived, in nice packaging that should work well in stores. There is also black and white versions available, we had only ordered one of each of the bright colors. 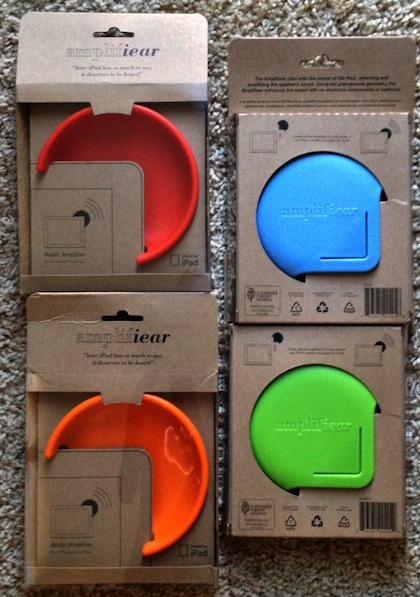 You may notice that the four colors perfectly match the color of the Apple Smart Case. There is actually a couple options in the area of redirecting the sound output by the iPad speaker to the front. Generally, they are barely larger than the speaker so while portable, the output is louder but ‘small’ sounding… which many feel isn’t a true improvement. The other issue is since these solutions fit over the edge of the iPad, most only work on a single iPad version. In the case of Amplifiear, they were in challenged early on with the same issue. To solve it, three space filling stick on form pads are included so you can use the Amplifiear on any of the three full size iPad and even an iPad in the Apple Smart Case (we are looking forward to next Friday to see if it will also work with the Mini!). 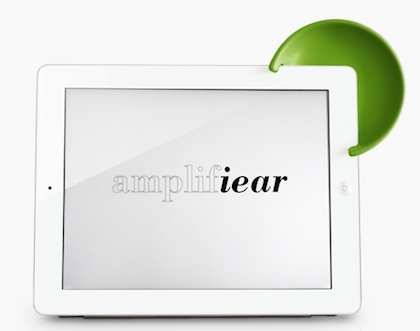 The Amplifiear is rigid to make it easy to snap on/off of an iPad. 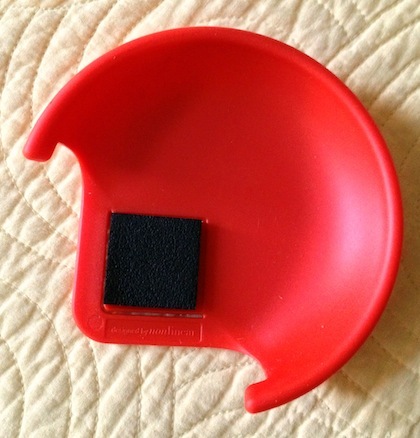 Yet, flexible enough that it doesn’t have that cheap hard plastic feel. Once we snapped one on at the office, the crowds grew to watch a movie. The sales and marketing folks where thinking about improvements to their demo videos being able to be shown to clients with the iPad on the desk, the gamers and home movie viewers where talking about the sound wont have to be turned to the maximum anymore, with the viewers enjoying the full show and not having the next rooms having to listen too. While the music isn’t punched up as a bass enhancing external speaker provides, this no battery solution will carry nicely in a bag with no need for wires or wireless.